When it came to making a sequel to the hit Left 4 Dead, Valve's artists had to make four new characters and five new environments, and a slew of new effects - and they had to do it in just one year. In case you missed it, despite all of the hullabaloo and controversy, last year's Left 4 Dead 2 was a f*cking great game that was what the first one should have been all along. Longer, harder, and better campaigns mixed with more varied weaponry and tools to deal with some nastier Special Infected than ever before - plus the new Scavenge mode, which is where I've clocked the vast majority of my 170+ hours in the game thus far. There's an interesting interview over on CGSociety with two of the Valve artists who worked on L4D2 - Character Designer Jeremy Bennett and Environment Designer Randy Lundeen - about the work that went into prepping the zombie-slaughter sequel in just a year. If you can get past the unintuitive article layout, there's some really great stuff in this behind-the-scenes look at the campaigns and character designs. The Deep South is rich in game play environments and charting the Survivors' path across these locales proved entertaining and artistically satisfying. Who wouldn't want to fight the hordes in a ruined Plantation House, an old Sugar Refinery during a thunderstorm or the iconic setting of the French Quarter? With the Deep South theme, New Orleans was an obvious choice for one of the campaigns. There's some technical stuff in the interview: How they created the massive environmental effects for the spectacular second half of Hard Rain, or how they created the new damage models for the Infected - did you know that there were 43 unique ways to damage Infected in L4D2? You did now! - but there's also some artistic stuff there, too. For example, in Swamp Fever there's apparently a consistent stream of water along the way that subtly leads players in the right direction. Who knew? 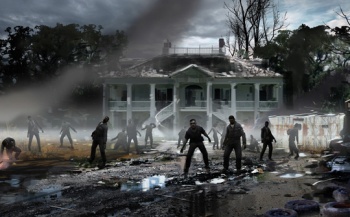 Beyond the nifty information on creating the colorful Deep South settings, Bennett offers us a peek into the creation of the four new Survivors as well as the three new Special Infected. The lopsided, surprisingly quick Charger, for instance, was designed with the distinctive vocal effect in mind to be a "a fast moving sledgehammer that will leave you with a health-depleting hangover." Essentially, it's a monstrous, living freight train. There's a lot more to L4D2 under the hood than many gamers give it credit for, say the Valve artists, particularly given the relatively short development time: "In the end, we were able to accomplish our ambitious development goals and expanded the universe of the franchise, creating fresh new settings, introducing new characters and creatures, adding new game play scenarios and introducing new tech features all in just one year." Of course, it remains to be seen if they'll try for a threepeat with a hypothetical Left 4 Dead 3 - but in the meantime, we get to look forward to The Passing DLC, bringing both groups of Survivors together for one (presumably epic) round of zombie slaughter. In the meantime, though, the game is still being patched and updated, with Versus mode getting bots for Special Infected (about freakin' time) as well as retooling the much maligned auto-spawn feature for the various campaign finales. My one complaint still remains, though: Why the hell didn't they call the New Orleans campaign No Quarter? I think that's a much better title, myself.